I'm super proud I made my goal of 52 blog posts in 2017. I hope I've educated and entertained you in the past year. To celebrate, here is some of the best stuff of 2017 and what we're looking forward to in 2018. There are some really fun places opening soon. First of all, Lifetime Fitness is opening a location in Chappaqua this summer. I'm in love with their Harrison location for the awesome shoreline indoor and outdoor pools (shoreline means toddlers can walk around in the water without you having to hold them up!) well as the daycare and kids classes. Oh, and I work out there too. But I'm not gonna lie, my favorite part is taking a shower alone while the kids are at the daycare. Also opening is My Gym in Dobbs Ferry. If you've been to the location in Larchmont, you know how fun it is and how great the classes and birthday parties are. Well now us westsiders can get to one without crossing the county. They are opening on January 22nd and are celebrating with 8 days of free programming between January 12th and the 21st. If you sign up before the 11th they have a special deal. Call 914-591-5437 and mention BabyGotChat for more info. Also, Larchmont Toddler is back and better than ever. This under-the-radar gem is the perfect spot for your little ones to shake their sillies out this winter. 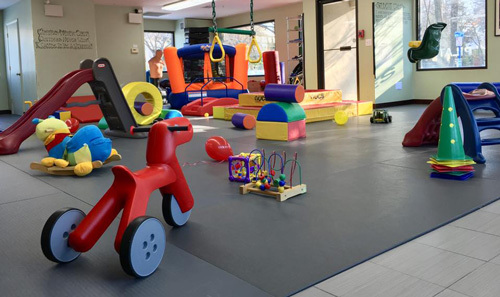 LT is a morning open-play gym for kids ages prewalker to preschool. Come between 9:30am and 12pm and play for only $10, with half-price siblings. They also offer drop-off play for an additional fee if you call in advance. A lifesaver for that last-minute doctor's appointment or just to get through Trader Joe's without going insane. We had a meetup there last month with Shake, Rattle & Roll Music (who hosts classes out of the space) and our 1-year-old had a blast. This summer my daughter will finally be old enough for dropoff full-day camp! Now I just have to navigate the endless options in the county for summer fun. Luckily there's the Westchester Family Camp Fair, taking place January 13 and 14 in Bedford and Mamaroneck, respectively. Meet the directors and representatives of some of the best day camps and sleepaway camps. Overwhelmed by too many camp choices? Have a kid with special needs or even just special interests? The Camp Connection is a free camp matchmaking service that will help you wade through all the flyers, websites, and brochures. With an arsenal of more than 600 summer camps, they will make objective personalized recommendations, and have personally prescreened every overnight summer camp they recommend. Did I mention the service is free? And I'm no food blog but Colony Pizza is opening in mid-May in Portchester. I grew up with the Stamford location and that thin crust pizza is awesome! They are kid friendly but their menu is basically pizza, pizza, or pizza, so if you have a kid who only eats french fries, you may want to stick to takeout. Know of an opening or new kids program you're looking forward to in 2018? Drop us a line at info@babygotchat.com! First of all, you love lists! Whether it's Easter Egg Hunts, Santas, restaurants where kids eat free, carnivals, or anything else I can boil down for you, you were all ears. But 2017 brought the big daddy of all lists and my greatest accomplishment (in the baby blog world anyway): EVERY LIBRARY TOT PROGRAM IN WESTCHESTER IN ONE EASY LIST! Sorry, that deserved caps. You loved it so much we're going to make similar lists in different categories, so watch this space. We also did a 3-part photo series in collaboration with expert photographer Jaye McLaughlin of The Life in Your Years Photography where we showed you how to transfer your photos from a zillion files to one (searchable!) database, how to organize them into prints for albums or around the house, and how to display them in a keepsake photo book. Better at organizing real objects? We tackled the topic of kid closets in our spring cleaning post. Our system cheaply and easily morphs their space from a pile of clothes and hangers into modular pods where clothes are easily stored, sorted, and rearranged for a kid's ever-changing wardrobe. And my personal favorite was The Cheap Mom's Guide to Westchester. I love a good high/low lifestyle, and for kid stuff there's almost no reason to go high. 1. Take a infant/child CPR class. Preferably in your home with grandma, grandpa, and all other babysitters. YourHomeCPR will come to you with dummies, videos, and everything you need, for the same cost for up to 10 people as other places charge onsite for 2 people. But in your house you get comfy seats, snacks, and bathroom breaks on your terms. 2. Keep newborns away from germs during flu season. I learned this the hard way and ended up in the PICU for a 10 days when my two-week old contracted RSV. It's no joke. 3. Take your kids to the dentist. It's easy and it's (mostly) fun. Make back your copay in free toothbrushes and toothpaste samples. I think we're good till age 7 on that front. 4. Be vigilant about water safety. Learn what drowning actually looks like (hint: it's not bouncing, screaming, and waving.) Don't leave standing water anywhere it could be forgotten about. Drain that bathtub before baby gets out and there's no chance you'll forget once they're toweled off and roaming around again. Flip over the baby pool when it's not in use. 5. Car seat safety! It's so important. Make sure those seats are properly installed and those little bodies are in there tight with no slack and no big puffy clothes to get in the way. 6. Don't drape a blanket over the stroller in hot weather. You're creating a sauna that's much hotter than the outside temperature. 7. And my favorite thing to repeat with prewalkers: Babies can't fall off the floor. It may seem crazy to put them down on the floor in a pinch, but you at least know not to step on them, they don't know not to roll off a couch, bed, or changing table. Thanks for coming along for the ride! We're looking forward to more fun in 2018, so follow us on Facebook and Instagram.